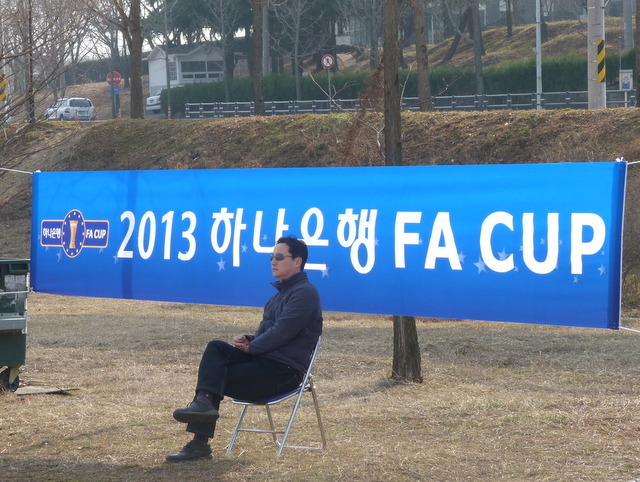 After watching the FA Cup game at Yeungnam University the plan was to take in another First Round game at Gyeongju the following day. 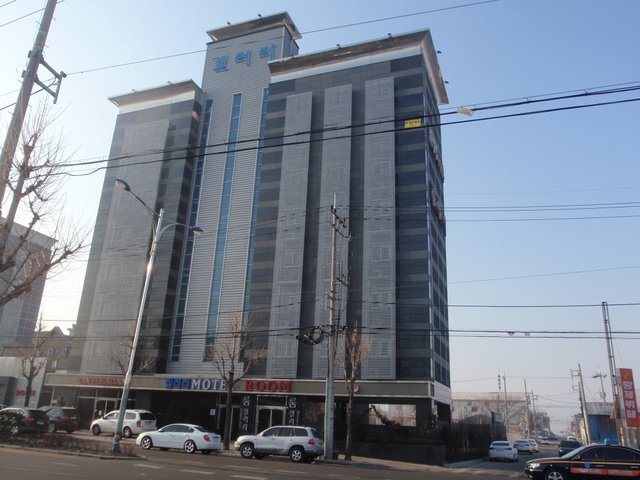 As it’s only an hour or so from Daegu to Gyeongju we thought that we might as well stay in Daegu overnight and make the journey the next morning. We booked into the Zen Motel and were rewarded with what was possibly the best equipped room that we’ve stayed in over here. As well as two bathrooms and a sauna it also had a professional looking karaoke system (including microphone stands) and a second telly that was concealed in the ceiling and could be lowered via remote control. Unfortunately it was probably the dirtiest room that we’ve ever stayed in. We ignored the variety of debris that we had chanced upon over the evening, but the clincher came the next morning when we found a used condom that had been discarded on to the floor next to the bed. I must have walked past it half a dozen times without noticing it. Had I stood on it then I might not have been so laid back about the situation. We took a luxury bus to Gyeongju before lunch, the journey takes an hour and seems a bargain to me at three quid. 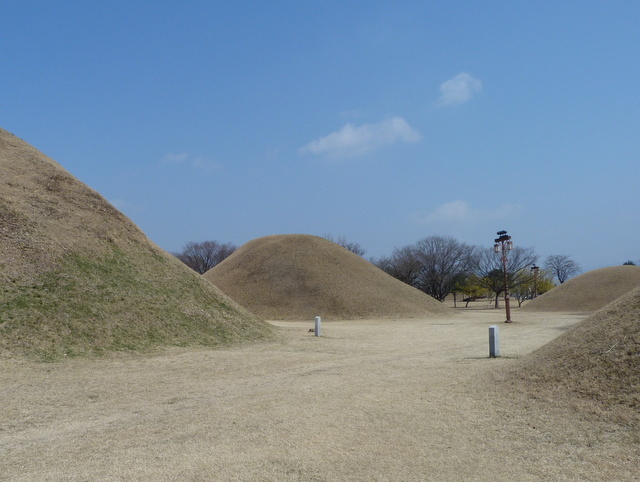 Gyeongju is famous for barley bread and dead kings. You can’t walk more than ten yards without stumbling across one or the other. We ignored the barley bread shops but one of the many dead king parks proved ideal for a picnic lunch. It’s half an hours walk from the bus station to Gyeongju’s ground. 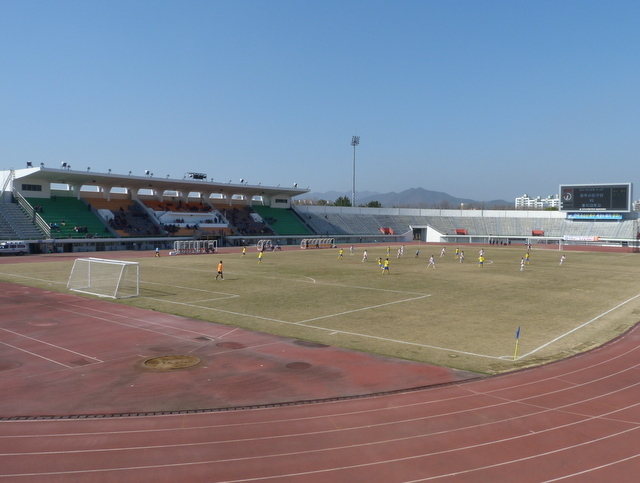 The football stadium is part of a bigger complex with taekwondo and wrestling venues, plus half a dozen artificial pitches, all of which could easily have staged this game. It was as well that we got there on-time as within forty seconds visitors Hongik University were a goal up. The ball had been swung in from the left and one of the students was waiting on the edge of the six yard box to angle the ball home. It’s on its way in. 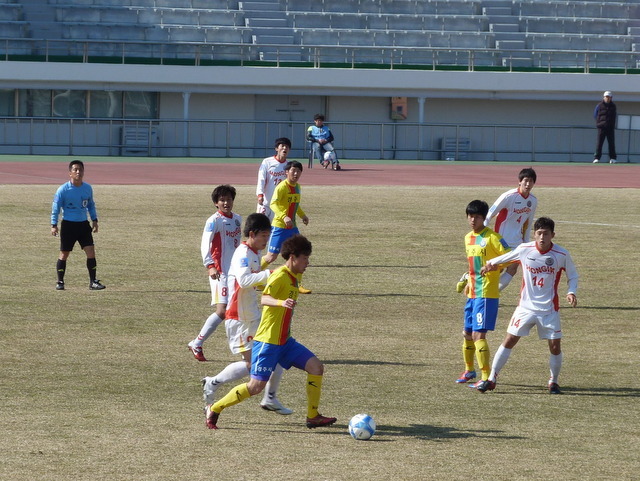 Fourth division Gyeongju were in their yellow shirts with a red and green central stripe and blue shorts. That’s too many colours for one team. Hongik wore a more restrained white kit with red trim. I did wonder if that early goal would be the start of a landslide but the home team got their act together and held their own for the rest of the first half. They had as much possession as Hongik and managed to force the keeper into a couple of decent saves. View from behind a goal. 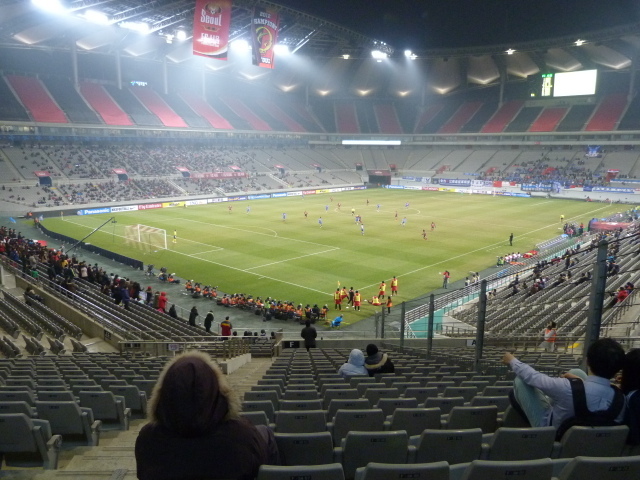 The stadium was a classic Korean bowl, with a small covered stand and open seating around the rest of the ground. Or at least it will have when the refurbishment is finished. A couple of blokes were bolting down new seats throughout the match, although at the speed they were going it may well be next season before the job is complete. Looking towards the main stand. By half-time the crowd had reached around eighty. There weren’t any ‘proper’ away fans, the type that stand behind the goal and bang a drum, but a few of the student’s mothers were hovering around, dishing out food and drink to any squad members who weren’t getting a game this week. 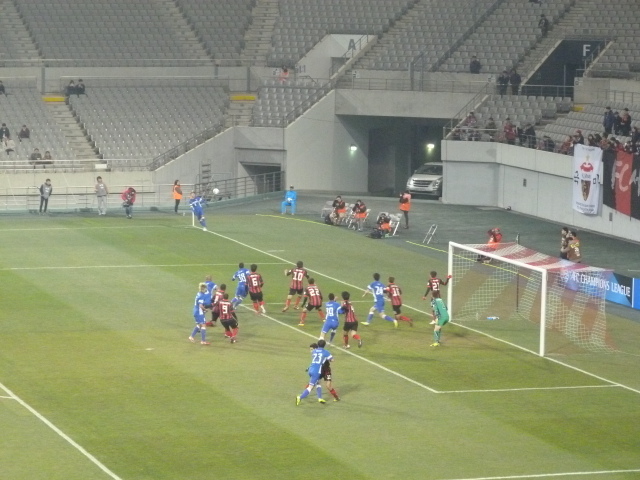 There were a few more chances in the second half and Gyeongju really should have equalised on the hour when a free-kick flashed across the goalmouth without anyone getting a touch. 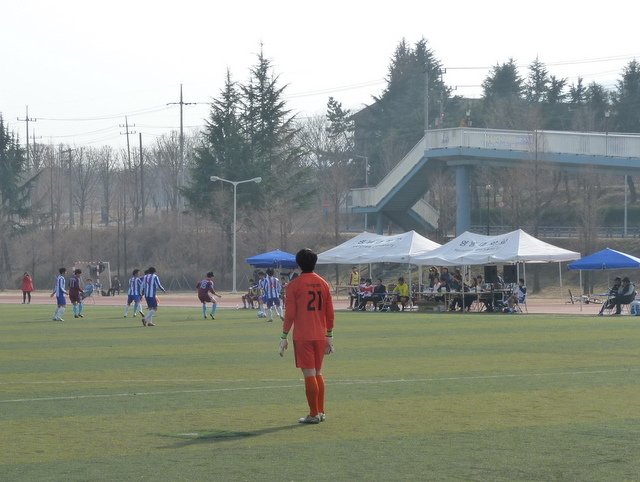 Ten minutes later and it was Hongik’s turn to go close with a shot that was stopped on the line by a home defender. The poor fella got the ball trapped between his feet for what seemed like an eternity before he dug it out like a week old bogey and hoofed it clear. Random action shot. Or maybe a spot of kung fu. 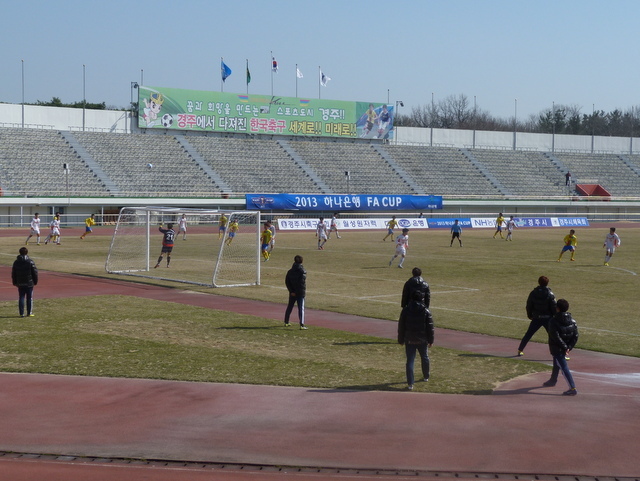 Gyeongju nearly got their equaliser a minute from time when a sloppy backpass let one of their strikers in. Fortunately for Hongik their keeper was a bit more on the ball than the defender had been and he was able to dash out quickly enough to get a foot in. Another view of the main stand. There were three minutes of injury time added but that wasn’t sufficient for Gyeongju to get an equaliser. Hongik were able to hang on for their victory having defended their lead for more than ninety-two of the ninety-three minutes played. Jen and I got a cab back to the station and had to spend a fair bit of time searching for food that wasn’t barley bread. In the end we settled for a restaurant that looked as if it had been around since the days when most of the dead kings will still have been alive. There wasn’t much of a menu and we ended up with pig soup. 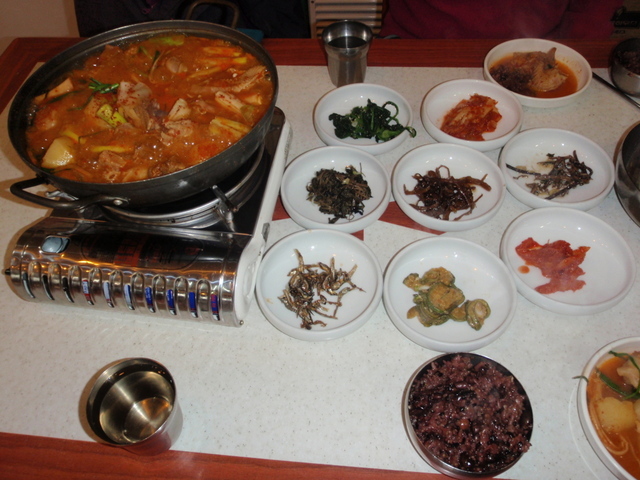 It needed plenty of pepper and a suspension of any thought as to what the bits of meat were. I ate most of it but left stuff that may have been eyelids, goolies or windpipes. Still better than barley bread though. 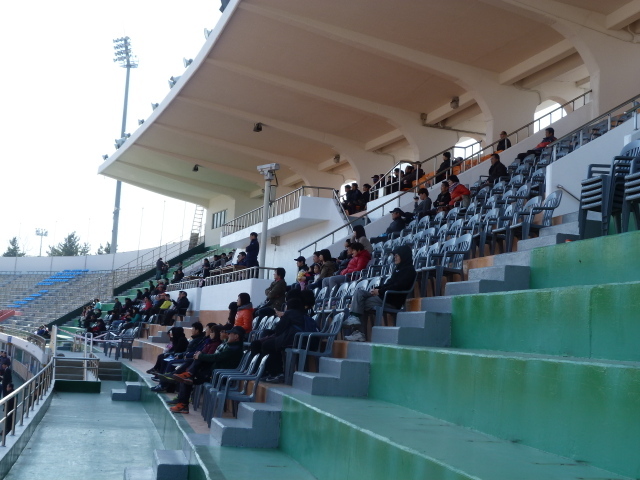 I’d missed the opening weekend of the domestic season in Korea, a last minute trip to Oman stopping me from taking in a fourth division game in Gyeongju and Jeonbuk’s trip to Daejeon. That’s life I suppose. Fortunately I didn’t need to stay in Muscat for a second weekend and that left me free to get to a couple of Korean FA Cup First Round games. The format of the competition seems to change every year. This season we have a total of sixty four teams taking part, with the First Round consisting of twelve of the eighteen fourth division sides and twenty of the universities. It seemed a little mean to deny the six crappiest Challengers League teams a crack at the cup, although in reality the university sides tend to be of a higher standard than the fourth tier and it may have been that the Korean FA were anxious to avoid the sort of scorelines that would suggest that the teams had played rugby rather than football. Jen and I caught the KTX to Dongdaegu and then took the subway to Yeungnam University. It’s the final stop on one of the two Daegu lines, the green one I think, and it takes around half an hour to get there. Conveniently the subway station is called Yeungnam University and there’s a pitch shown on the map inside the station, close to exit four. Sure enough, the pitch was just where the map suggested. What the map didn’t show was that there was more sand than grass and there were no lines marked. It looked a long time since anyone would have played at that venue, or at least anyone who would worry about having a foot disappear down a pothole. It was a shame really as the old ground had a certain charm to it. The minimal rows of seating would have been more than enough and the ‘main stand’ reminded me of a cricket pavilion. Jen spoke to a fella who looked like he might know what was going on and he directed us around the corner to the artificial pitch ten minutes walk away. 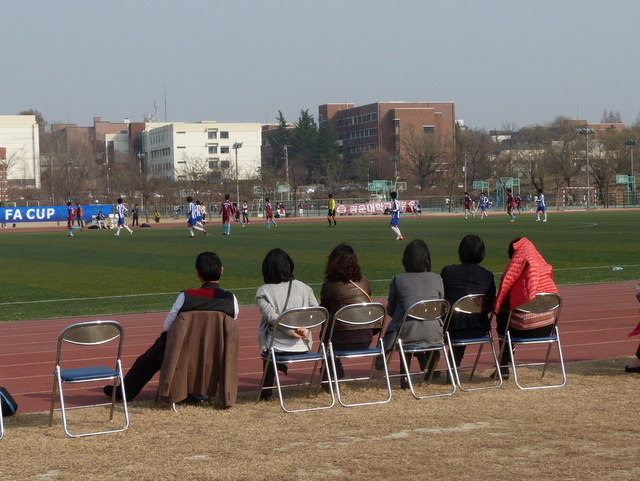 There weren’t any permanent seats alongside the artificial pitch, just a large pile of folding chairs. That was sufficient though for the thirty or so spectators, most of whom were probably there to watch their offspring play. Those tents were for the players and officials, rather than spectators. Yeungnam were dressed up as Brighton, whilst Kwangwoon sported a Burnleyesque claret and blue effort. The conditions weren’t ideal as we started with a strong wind blowing towards the Yeungnam goal. Kwangwoon had the better of the opening exchanges but both teams were keeping the ball on the ground and passing it well. The visitors had the best chance of the half, hitting the post five minutes before the break. 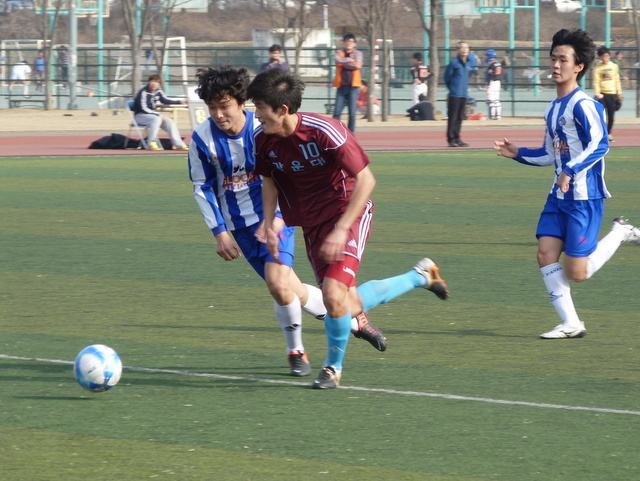 Yeungnam in blue, Kwangwoon in maroon. Yeungnam picked up a bit after the interval although perhaps this was due to it being their turn to have the wind behind them. Whenever there was a lull in play I could occupy myself watching the old fellas walking around the track or the young girl being taught by her grandad to ride a bike. We had a bloke on a scooter doing a couple of laps as if he were Barry Sheene and then equally memorably someone galloping a circuit on a horse. As the clock ticked down to full-time I started to worry a little about running out of beer. I’d paced myself perfectly for ninety minutes but the prospect of extra time and penalties was something that I hadn’t allowed for. That’s about a quarter of the crowd. There were less than ten minutes and half a can remaining when Kwangwoon made the breakthrough. Their right back made a perfectly timed overlapping run that took him past the opposing full back and left him clean through on the advancing keeper. He beat the goalie to the ball and clipped it past him to open the scoring. Yeungnam understandably showed a touch more urgency in the closing minutes but couldn’t take their chances. 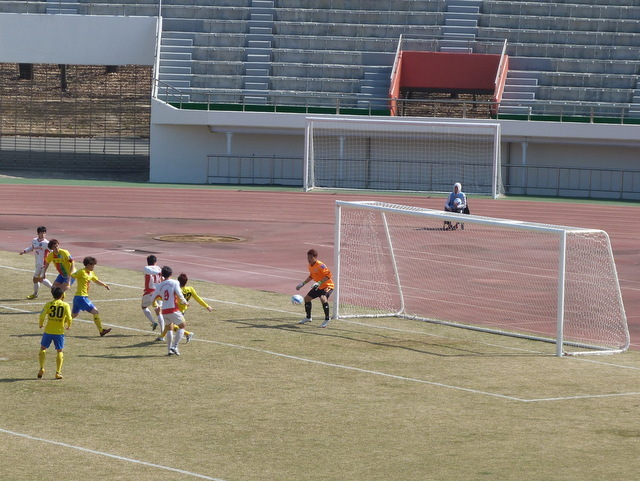 Kwangwoon made it safe with the last kick of the game, one of their strikers controlling the ball eight yards out and turning well before stroking the ball home. The next round sees the slightly bigger guns of the third tier National League and the new second tier K-League join the competition. So, I imagine that’ll be more chairs and fewer horses. Probably. It’s the new season and about bloody time too. Whilst basketball is all well and good, it’s not football. Not even close. 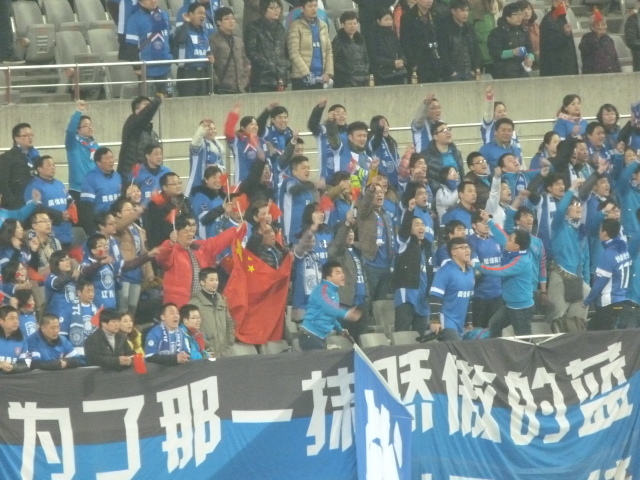 And in case you were wondering why you haven’t heard of Jiangsu Sainty, it’s because they are from China. This was a Champions League fixture as the Korean domestic leagues don’t kick off until the weekend. Still, it’s a football match and so I went along. I heard the hum of the vuvuzelas as I emerged from the subway station. There’s only really Seoul where that nonsense still goes on these days. In Korea anyway. I imagine the South Africans won’t have consigned theirs to the skip yet. I wondered if the noise was actually a recording as it seemed suspiciously loud for a game with what I suspected was going to be a pretty low attendance. I bought a twelve thousand won ticket for the East stand. I usually go behind the goal with whatever away fans are visiting, but on this occasion I fancied observing the Chinese supporters from somewhere that gave me a decent look at them. There were about three hundred of them and initially they made as much noise as the thousand Seoul fans in the opposite end. Both sets of fans waved massive flags but in a nice touch a lot of the Chinese fellas were also waving red flags that looked to be the perfect size to stick in the top of a sandcastle. Seoul had all of last season’s foreign players back for another year although I didn’t recognise Escudero at first as he’s spent the winter growing some hair. It wasn’t long before they made an impact and ten minutes in Escudero rolled the ball into the path of Dejan Damjanovic who stroked it home from fifteen yards out. Sainty had a couple of big defenders who looked as if they had spent their off-season eating pies rather than growing their hair. They were dangerous at set pieces, particularly if they collided with anyone, but not particularly mobile when asked to defend. With half an hour gone a neat passing move from Seoul was too much for the statuesque centre halves and Yun Il Lock finished well to put the hosts two up. Gratuitous admittedly, but so wrong at football. At half time I moved to the North West corner, partly because I could but mainly so that I could get an idea of how many people were in the East stand. Not many is the answer. The official attendance was announced as 6,321 and whilst I didn’t actually count the people there, the crowd was small enough for me to be confident in my estimate of there actually being around four thousand fans inside the stadium. 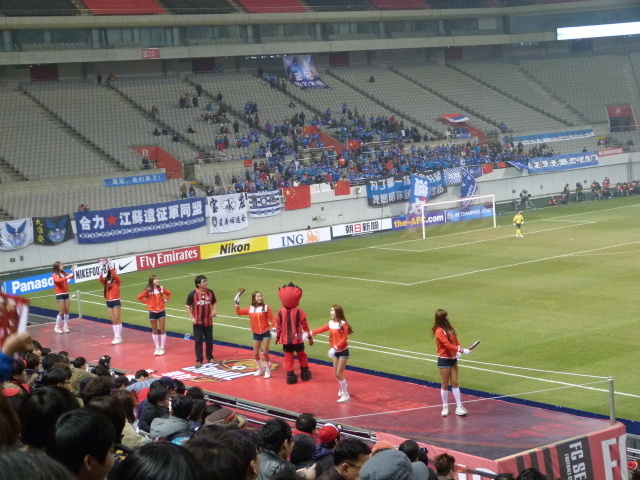 Seoul have taken the decision for this season to close the upper tier in all but the West stand. I’m not sure why they’ve left that one open as there’s usually only around fifty people who choose to sit there. 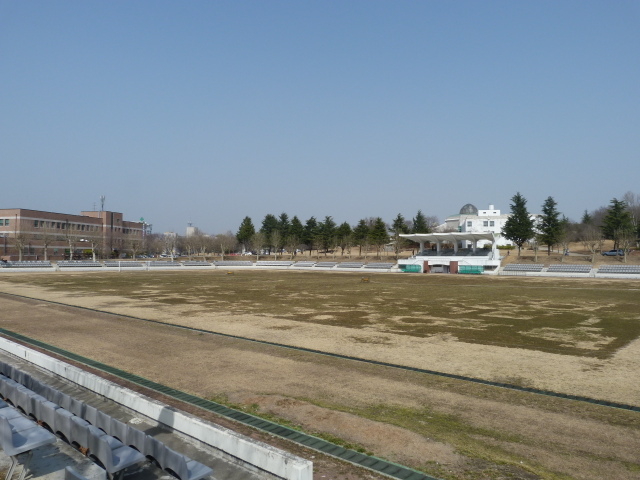 The blocking off of the areas will probably reduce the capacity to around forty thousand I’d imagine and even for the games against Suwon that will be more than enough these days. The view from the north-west corner. Ten minutes into the second half Molina flicked the ball on to find Yun Il Lock in space and the kid notched his second of the game. It didn’t take long for Dejan to get his second as well as another smart passing move on the hour ended with him taking the score to four-nil. 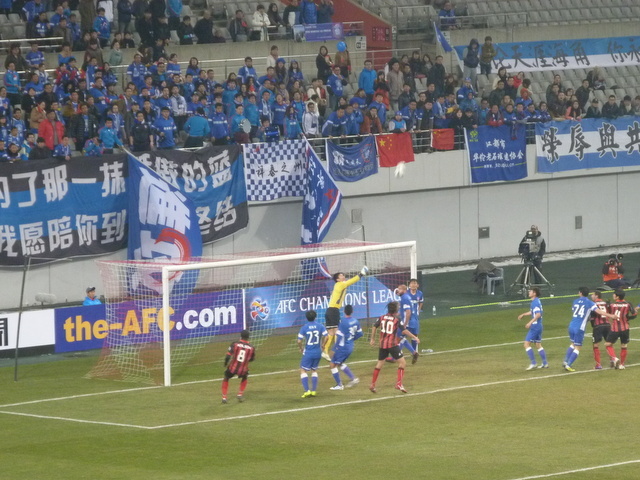 Sainty pulled a goal back ten minutes from time when the Seoul defence failed to cut out a ball played across the box. It gave the away fans something to sing about but it didn’t mean much. This was from the first half. I nipped away a few minutes from time, not so much to avoid the traffic as there was none, but more because the temperature had dropped quite significantly. As I approached the subway I heard the sound of a fifth goal for Seoul being celebrated. A quick check the next day revealed Molina had tucked it away, a fair reward for his performance I thought. Five – one was how it finished, the win taking Seoul to the top of their group. 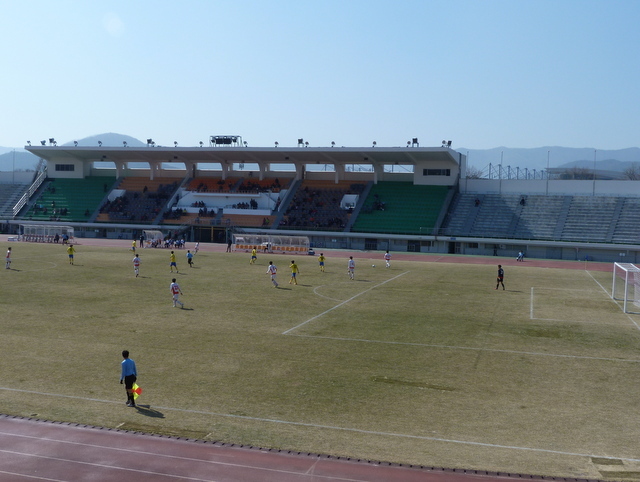 I tried to get to Woraksan a couple of years ago, but instead spent all day in Chungju waiting to see a football match that had been re-located at the last minute to somewhere out of town. Once I’d realised this it was too late to catch the last bus to the National Park. This time though, the football season had yet to start and so I wasn’t expecting any problems. 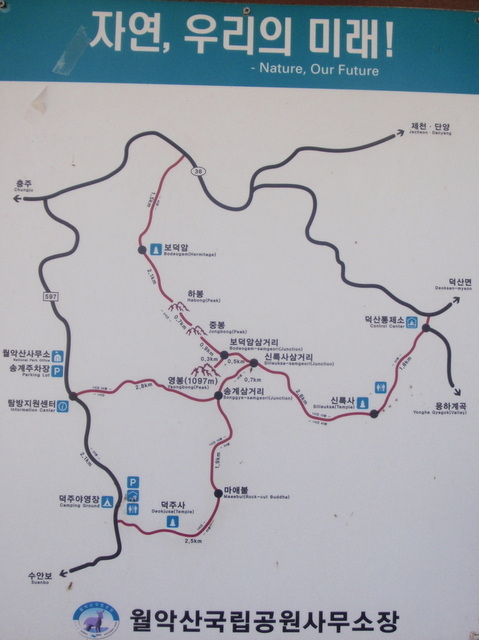 The plan was for Jen and I to take the bus to Chungju from the Central City terminal. There’s one every half hour, with the one on the hour being the de-luxe version with wide seats, extra leg room and minimal livestock. Chungju must be a popular destination on a weekend though as despite getting to Central City mid afternoon the first available seats were on the six o’clock bus. There’s a big shopping mall at the bus station with restaurants and coffee shops so we just filled the time in by eating and drinking. We had that chicken thing that comes in a dish that is about the size of a bin lid. The one with the sweetish brown sauce, plenty of potatoes and with glass noodles sneakily hidden under the good stuff. We rarely get around to eating the noodles as there’s usually enough chicken and potato not to have to bother with them. Besides, I’d only brought the one pair of jeans and I didn’t want to be splattering them with sauce before I’d even left town. The journey to Chungju took an hour and forty minutes. Oddly enough there didn’t seem to be any motels in the area around the bus station. The railway station is only about fifteen minutes walk away though so we headed for that. We soon spotted the neon lights and had a full row to choose from. Most of them looked new, although maybe they had just had the outside cladded so that sleek aluminium covered up the fake stonework that used to be so popular. The one we picked seemed ok. I think it was fifty thousand won, although as I’m writing this ten days later I can’t actually remember. The room was pretty smart though, definitely a step up from some of the places we have stayed at. Not a turret in sight. 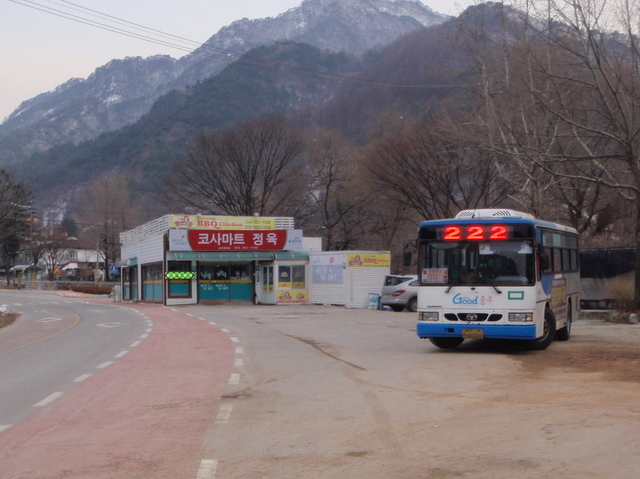 I’d previously managed to get the times of the buses to the Deokjusa entrance to Woraksan from the Chungju Tourist Information Office, but we didn’t know the number or where the bus stop was. The easiest thing to do in those circumstances was just to take a taxi and so that was what we did. Forty thousand won and half an hour later we were pulling up outside Deokjusa temple having overtaken a few hikers on the last mile or so of the route. 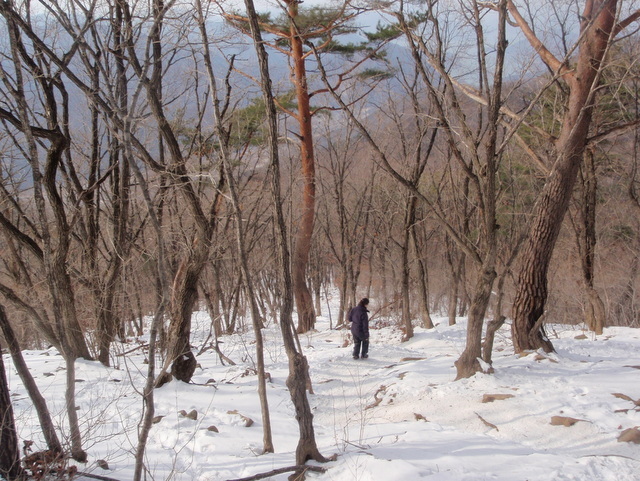 The map showed that we’d have a further 4.9km to hike to reach the 1097m Yeongbong summit. I’d read somewhere that the trail started off fairly gently but then increased in gradient over the last two kilometres and had a particularly evil twist in that there was a long descent before you reached the top that meant you had to gain the ground all over again. I hate doing that. I want a steady ascent on the way up and then when I’ve got to the top I expect to be just heading downwards. It’s great when you get some flat bits as well, particularly when you are at a decent altitude, but I’d prefer no downward stretches on the way up and no strenuous climbs on the way down. It wasn’t really as I’d read though and the first couple of kilometres seemed just as steep as most places. 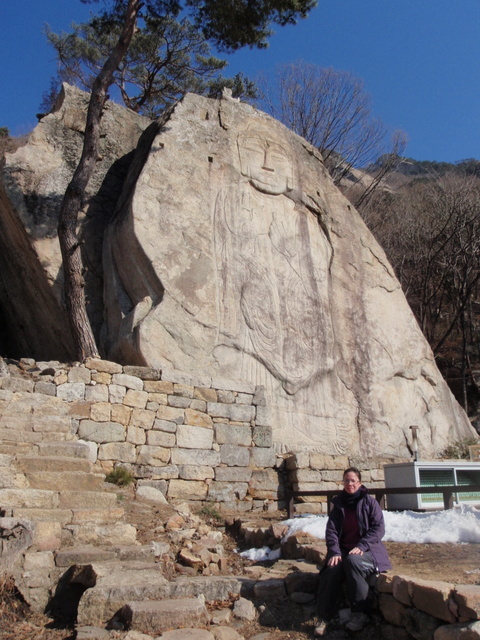 About an hour in we passed a stone Buddha carved into a rock. I’m no historian, so we’ll just say it dates from the olden days, maybe mid to late period olden days. It looked newer than that though so I suspect that the monks had been busy with their chisels. Easier to make than a proper statue. As we got higher the snow got more tightly packed and we’d have struggled without spikes. Once we were in the last couple of kilometres I kept expecting the big descent but it never really came. Instead we had lots of short downward sections, some of which we needed to make use of the ropes and railings to avoid slipping and perhaps disappearing off the side of the mountain. Inevitably the downward sections were followed by even steeper upwards sections. That’s it from about an hour and a half away. It took us almost four hours to reach the top, the last hour or so involving some of the steepest staircases I’ve encountered here. The six inches or so of snow didn’t make it any easier and I felt sorry for the bunch of kids that were dragging themselves up with just trainers on their feet. Jen is on the right, hidden by the tree. I don’t know who the others are. There were good views in all directions from the top but we didn’t hang around for much more than ten minutes. 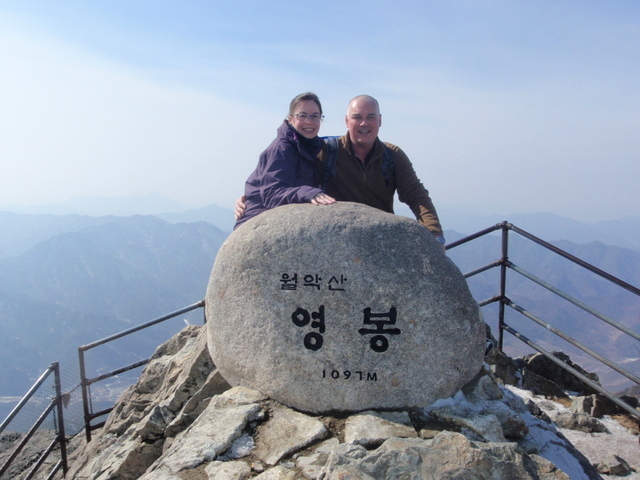 With plenty of uphill bits to do on the way back I doubted that we’d knock much more than an hour off the time it had taken us to get there and we had to get back to Chungju. Part of the way down there’s a junction with an alternative route back to the car park. It’s a kilometre or so shorter than the way we’d came up but I suppose the downside is that it’s a little steeper. We gambled on taking it anyway to avoid some of the slippery sections that we’d encountered on the way up. It started off ok, with a clever little zig-zag route that took the sting out of the slope. As we got further down though there were sections with very little snow and good as the spikes were they don’t really do much on ice-covered rocks. Jen had a few trips, one involving a full head over heels manoeuvre. The short cut paid off in the end though and we were at the bottom in two and a half hours. It’s probably the worst ratio of time to distance that we’ve ever done, averaging less than a mile an hour, but that was more due to the conditions underfoot and the undulating nature of the trail rather than a drop in fitness levels. If anything, we probably stopped for a rest less frequently than normal. Once we were back on the road we looked in vain for a taxi. Outside of a restaurant there was a bus destined for Dong Seoul that would have been perfect had we not stashed all of our surplus gear in a locker at Chungju Bus Station that morning. Running out of options we decided to eat in the restaurant and then get them to call us a cab. The restaurant had a pretty limited menu and the old biddy in charge seemed keen that we eat her special rice, which was described as a bowl of rice with other stuff mixed in that you could pick up and eat between those skinny sheets of seaweed. After a day’s hiking I was hoping for something a bit better than that and after turning down kimchi stew we ended up with another bin lid full of chicken and potatoes. The chicken wasn’t as good as we’d had the day before, there seemed to be more skin and bones than meat, but they were generous with the potatoes. Good as the special purple rice was, the other stuff was better. There were timetables on the wall and we were able to work out that there was a bus back to Chungju at 5.45pm, which gave us just enough time for us to eat the best bits of the meal. The family of the old biddy seemed to be eyeing up what was left of the chicken, which seemed fair enough. They were pretty much out of luck with the potatoes though. Before snaffling what was left of the food they very kindly identified the bus outside as being the right one and hurried us onto it. 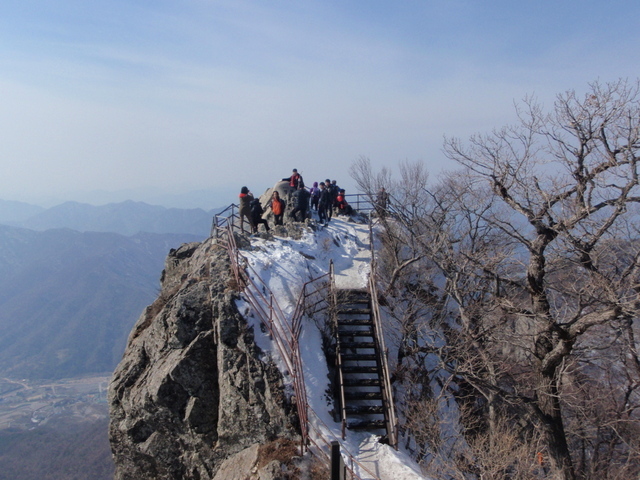 We were the only passengers when it set off so it seems that most people who hike Woraksan either come as part of a tour or else have a car. The bus took about half an hour to get us back to Chungju. It didn’t have any stops scheduled for anywhere that we knew so we just got out when the streets started getting busy and caught a cab to the bus station. 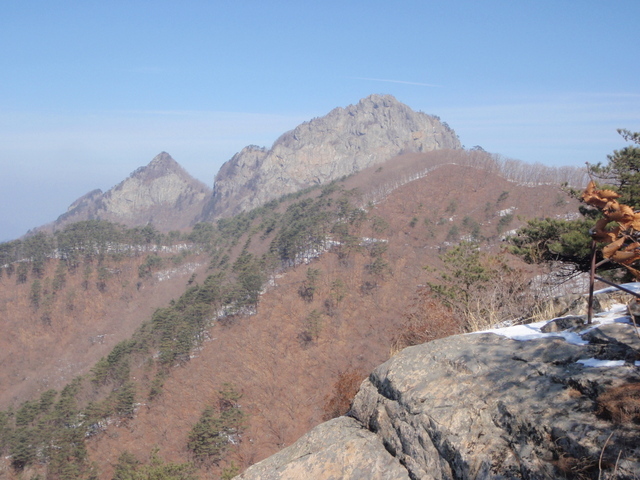 That makes it fourteen of the fifteen mountain National Parks hiked in now, just Juwangsan to go.